Open up almost any bookbinding book and flip back to the suggested suppliers page, and you're sure to find Chicago's Aiko's Art Materials. Specializing in hard-to-find Japanese papers and art supplies, Aiko's was a treasure trove for any artist. For years I lived with this jewel of a store just up the road from my apartment, and years later still I relished trips back to the city to visit it again. Vacationing in Chicago this past month I was sad to find we’ve all lost this amazing resource, Aiko's Art Materials closed its doors in April after more than 50 years in business. So without Aiko's, I wondered, where can you go in Chicago to get your paper fix? The good news is that there’s lots of spots, all easy to reach from the el train. 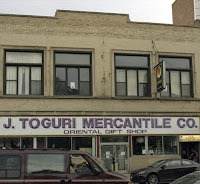 Just down the street from Aikos' former site, east on Belmont near the Clark and Belmont el stop you'll find J. Toguri Mercantile. While it does have a small selection Japanese papers the real reason to hit J. Toguri is for the Japanese art supplies, books and home décor. After a visit if you’re still in a Japanese frame of mind, head a block west on Belmont to Ragstock (upstairs from Hollywood Mirror) and check out their huge (and inexpensive) collection of kimonos. Closer to downtown you have two Paper Source stores to choose from, each one just a block off the el (one at Armitage and one at Chicago). 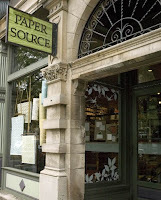 Paper Source is a chain with a strong presence on the web, but a visit to the store is worth it for the helpful staff and a look at a few non-web offerings (I found some great hemp thread for binding). They also have the largest selection of papers I found in Chicago, including some lovely washi and very reasonably priced book-cloth. It's well worth a visit. One last stop, make sure to visit Columbia College's Center for Book Arts (again an easy walk from the el). The second floor space houses classrooms, galleries and the "Un" Store, a window case of goodies that can be purchased from the front office. 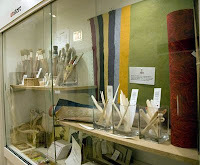 Goods on offer include papers, papermaking fibers, and even bookbinding t-shirts. Go Chicago! Great shops... I live in Chicago so these are good to know. I shop mostly at Paper Source (they have great decorative paper and lots of fun stuff) and Hollander's (online).